New China Hand: In it for the Long Haul? The news agenda has moved on only stutteringly from the Hong Kong protests. The recurring spectre of pollution in north China has reared its head again as we approach the colder months; Chinese delegates are off in Germany signing high-level trade deals; and eyes are on the typhoon heading towards Japan, but the protests remain in the background with every new development seized upon like it might suggest some sort of solution. As mentioned last week in this blog, we’ve seen the best and worst of Hong Kong during the protests, but it seems the revelations about the attitudes of those who rule Hong Kong – and those opposing them – just keep coming. The picture now is of two sides with fundamentally different values and who just won’t budge: the negotiations scheduled for last Friday collapsed in an atmosphere of deep mistrust and political calculation. This could go on and on. Despite recurring clashes in Mong Kok, government calls to back down and fractures within the movement, the barricades remain firm and the sites well-and-truly occupied. LegCo – the territory’s law-making body – has yet to resume. Arguments abound as to how much this is costing the economy, to what extent continued disruption will be tolerated and the will and final goals of the protestors. As of this moment, though, there is no light at the end of the tunnel. It’s difficult even to picture what that light would even look like! Is this the new era of civil disobedience promised? Comments below – what do you think it will take to bring the crisis to a head? 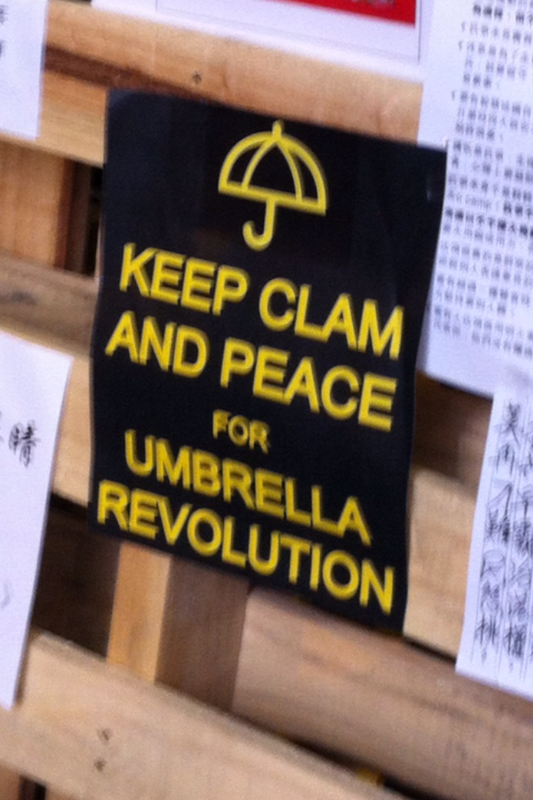 Keep Clam and Carry on! China has to stop trying to strong hold Hong Kong and let the pearl of the south just be. Hong Kong is a huge financial center, China should just let things keep working the way that has been happening for ages. This discontent does nothing to keep Hong Kong running smoothly, China just needs to leave well enough alone. Yes, but Hong Kong is a part of China now, which must mean having to accept some direction from Beijing. Otherwise we’re talking about secession, which will only result in much needless bloodshed. I think the real heart of the problem isn’t democracy, or Beijing, but just wanting to have good government. I think even Beijing and the most vehement members of the current administration must realise that changes need to take place as the current system is not serving the city well. But does Beijing know how to give direction, or does it just expect compliance and submission. The sad part is that this may not be resolved for quite a long time. I have to say though, it would be wonderful if Hong Kong could succeed from China and just be its own territory. Then again, there might still be the government issues if the same people were still in power. This entry was posted on October 13, 2014 by theguestroom in LionRockNews, NewChinaHand and tagged Asia, Best, Blog, China, crazy, HK, Hong Kong, keep clam, Lion Rock News, MTR, new china hand, number 1, number one, occupy central, the guest room, Top, umbrella revolution.